CARTIER, TOUSSAINT, called “the hermit of Saint-Barnabé”; b. c. 1707 in France; d. 30 Jan. 1767 and buried the next day in the church of Saint-Germain de Rimouski (Que.). Information about Toussaint Cartier comes primarily from the burial register for the parish of Saint-Germain de Rimouski and the account left by Archbishop Joseph Signay*. In July 1838, at the time of his second pastoral visit to the parish, the bishop of Quebec gathered the testimony of old people concerning this strange character. These people, of more than 80 years of age, remembered the hermit’s story, told to them by their parents. 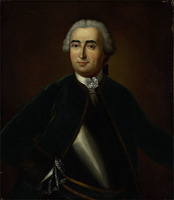 Toussaint Cartier was believed to have been born in France about 1707, and according to Montcalm he came from “the region of Morlaix.” Cartier arrived in Canada shortly before 1728 and obtained from Pierre Lepage de Saint-Barnabé, seigneur of Rimouski, a piece of land on the Île Saint-Barnabé; there he settled as the result of a vow he had made during the crossing. When he was about to perish, he had promised to live apart from the world in the first place on which he could land. He lived on the island until his death, subsisting on the fruits of his work and the generosity of the habitants, the seigneur of Rimouski, and Father Ambroise Rouillard, the local missionary. The latter regularly invited him to eat with him and often visited him in his hermitage on the island. The hermit of Saint-Barnabé came to a sad end. In January 1767 he was found unconscious on the ice of the St Lawrence River; he had been trying to cross to Rimouski. He was carried to a house on the north shore of the Rimouski River, and there he died on 30 January. The habitants of Rimouski long retained the memory of the hermit of Saint-Barnabé; oral tradition made of this illiterate person a descendant of the famous Jacques Cartier*, but it seems clear that the latter never had any children. AAQ, 69 CD, Visites pastorales, XI, 116–19. Archives judiciaires de Rimouski (Rimouski, Qué.) Registre d’état civil, Saint-Germain, 30 janv. 1767. “L’hermite de Saint-Barnabé,” BRH, XLIV (1938), 113–14. Journal du marquis de Montcalm (Casgrain), 52. 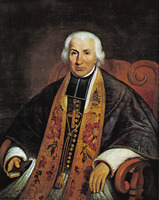 Ivanhoë Caron, “Inventaire de la correspondance de Monseigneur Joseph Signay, archevêque de Québec, 1837–1840,” APQ Rapport, 1938–39, 268. Tanguay, Dictionnaire, II, 570. J.-C. Taché, “L’île Saint-Barnabé,” Les soirées canadiennes; recueil de littérature nationale (Québec), [V] (1865), 347–57. Michel Paquin, “CARTIER, TOUSSAINT,” in Dictionary of Canadian Biography, vol. 3, University of Toronto/Université Laval, 2003–, accessed April 24, 2019, http://www.biographi.ca/en/bio/cartier_toussaint_3E.html.